• The final effects of a giant solar flare are being felt today on Earth, but experts warn a direct hit would spell the end of civilization. On September 10, a huge solar flare let loose from the middle of the sun, hurtling two coronal mass ejections directly towards Earth, with the potential to blast us back into the Stone Age. 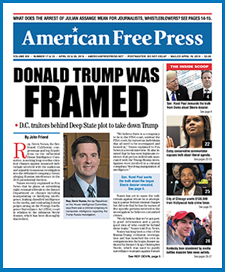 AMERICAN FREE PRESS has given this issue coverage in the past, and we invite you to become familiarized with this topic that the mainstream media has determined is not worth your time. Also, check out the below book, offered by AFP’s sister publication, THE BARNES REVIEW, which examines, among other things, the catastrophic solar outbursts that ended the last ice age. Building upon his revolutionary theory that the Sphinx dates back much further than 2500 B.C., geologist Robert Schoch reveals scientific evidence of an advanced civilization predating ancient Egypt, Sumeria and Greece, as well as the catastrophe he believes destroyed it 12,000 years ago. This book demonstrates, based on the 12,000-year-old megalithic complex of Göbekli Tepe, that an advanced Neolithic civilization existed thousands of years further back than believed possible. Schoch presents scientific confirmation of this advanced civilization that he says thrived at the end of the last ice age, the solar catastrophe that destroyed it, and what the evidence means for today. Schoch also examines the catastrophic solar outbursts that he believes ended the last ice age, wiping out antediluvian civilization and incinerating much of the evidence of that period. He also issues a warning based upon sound data saying that solar outbursts are powerful enough to devastate our modern civilization. Can you translate that to Achameneian? The current Sun has dozens of sunspots, instead of usual 2 in a normal Sun cycle. With so many sunspots, it was known to the Mesoamericans as ‘Jaguar Sun’. The Leopard skin wore by the Egyptian pharaohs certainly knew the same galactic, Solar and earth cycles as deep research confirms. The solar, enlightened kings claimed the titles: Ahau Kin-Maya; Achameneian Kings-Greece and Persia; Yellow Emperor/Ming dynasty, related also to Min and Tav. Sultan of the Turks and Sol-om-on of the ancient Israel. Even Is-Ra-El means ‘Virgin/Infant/Young-Is;Sun-Ra and El-god. The current Galactic alignment of our Sun with the Black Hole (the 13th house of zodiac) has consequences on our ERUPTING SUN, and causing EXTREME WEATHER on Earth, which will be followed by Earth re-polarisation in cca 2019 with massive movement of earth crust! The next poles will be at baikal Lake and central Chile. The Sun had repolarised in 2013. Beside Sun-solar eruptions and EMP outburst, there are also known or predicted Galactic core outbursts!